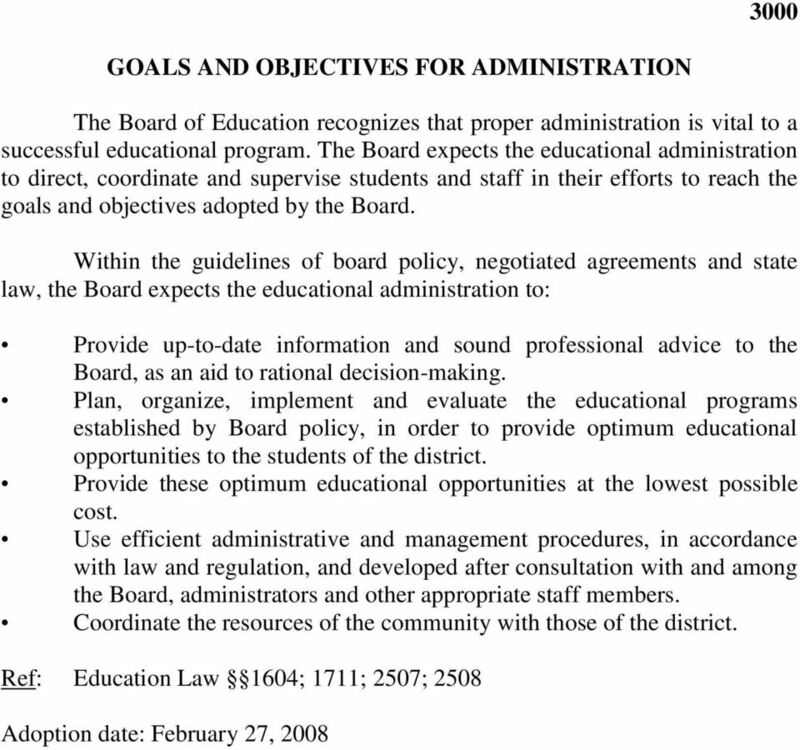 Download "GOALS AND OBJECTIVES FOR ADMINISTRATION"
7 3210 ADMINISTRATIVE TEAM The Board of Education recognizes that the quality of the district's schools is in large measure dependent upon securing maximum participation of all members of the management team, which consists of the Superintendent of Schools and the administrative staff. The Board intends to provide a sufficient number of administrative and supervisory positions to promote the attainment of district goals. 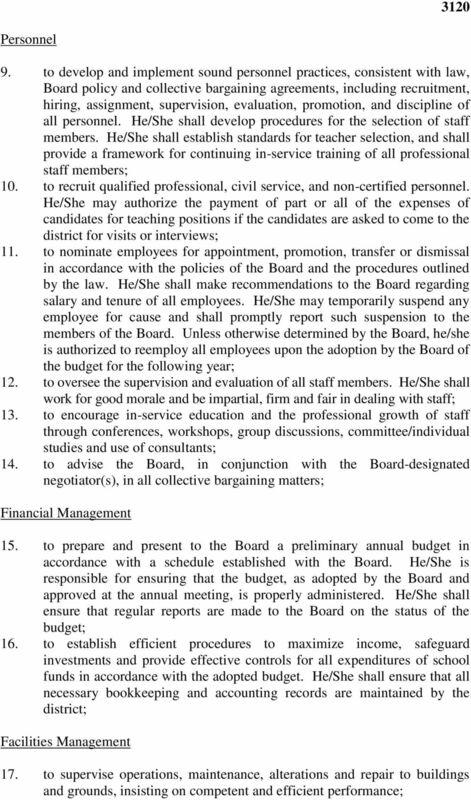 Personnel needs will be determined upon recommendation of the Superintendent, subject to the approval of the Board. 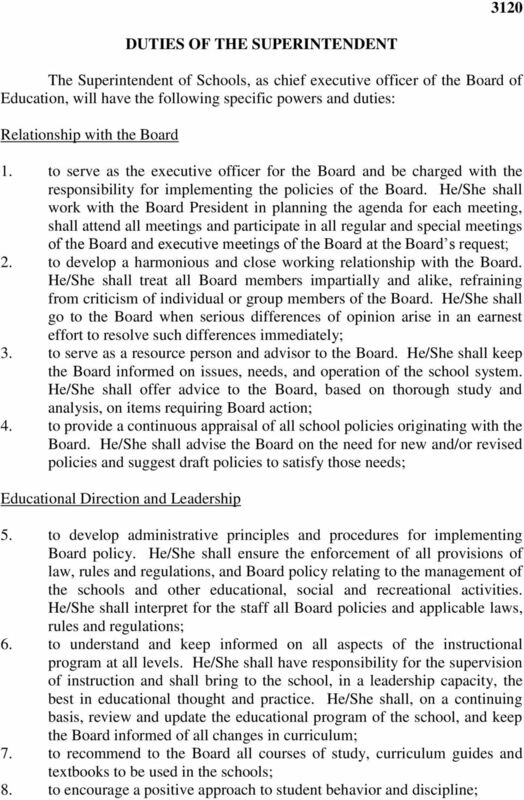 In each case, the Board will approve the broad purpose and function of the position in harmony with state laws and regulations, and delegate the task of writing a job description for the position to the administration, subject to Board approval. 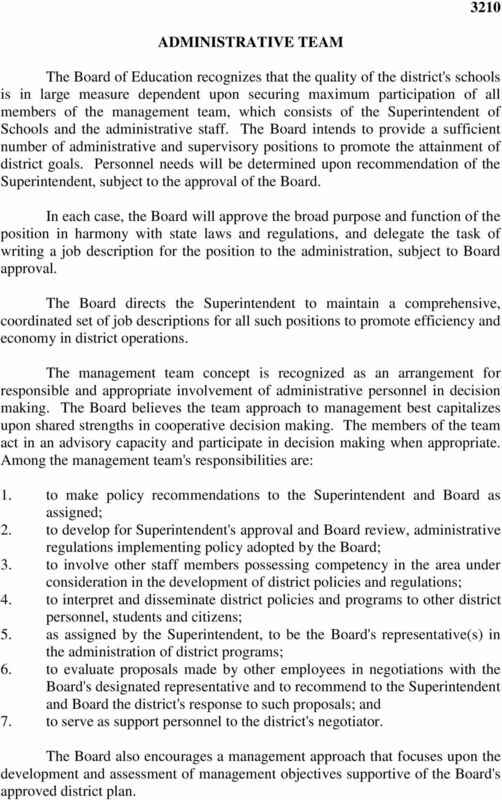 The Board directs the Superintendent to maintain a comprehensive, coordinated set of job descriptions for all such positions to promote efficiency and economy in district operations. The management team concept is recognized as an arrangement for responsible and appropriate involvement of administrative personnel in decision making. The Board believes the team approach to management best capitalizes upon shared strengths in cooperative decision making. The members of the team act in an advisory capacity and participate in decision making when appropriate. 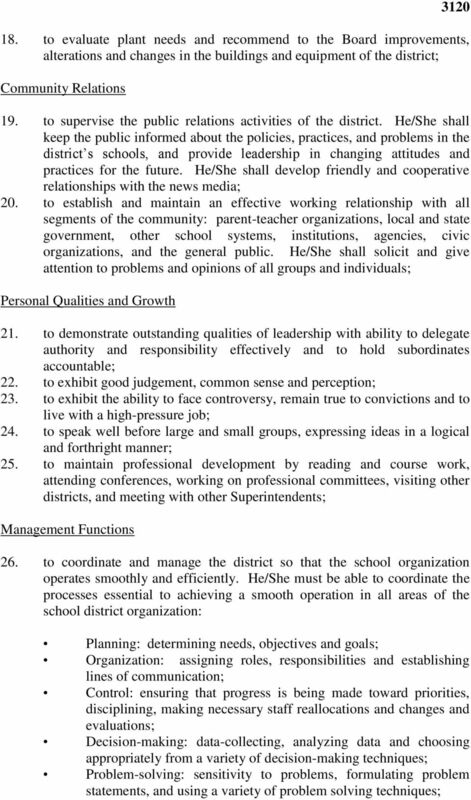 Among the management team's responsibilities are: 1. to make policy recommendations to the Superintendent and Board as assigned; 2. to develop for Superintendent's approval and Board review, administrative regulations implementing policy adopted by the Board; 3. to involve other staff members possessing competency in the area under consideration in the development of district policies and regulations; 4. to interpret and disseminate district policies and programs to other district personnel, students and citizens; 5. as assigned by the Superintendent, to be the Board's representative(s) in the administration of district programs; 6. to evaluate proposals made by other employees in negotiations with the Board's designated representative and to recommend to the Superintendent and Board the district's response to such proposals; and 7. to serve as support personnel to the district's negotiator. The Board also encourages a management approach that focuses upon the development and assessment of management objectives supportive of the Board's approved district plan. 9 3230 ORGANIZATION CHART The Superintendent of Schools shall maintain an administrative organization chart showing the relationship among the various administrators and staff. 10 3240 LINE AND STAFF RELATIONS The following principles shall govern the administrative operation of the school system: 1. 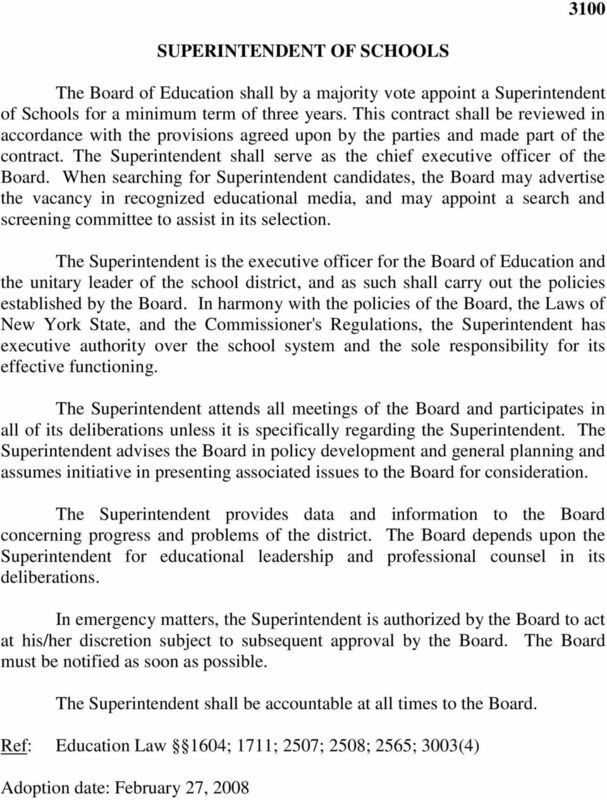 The Superintendent of Schools shall have specific responsibility for overseeing the district educational programs. 2. 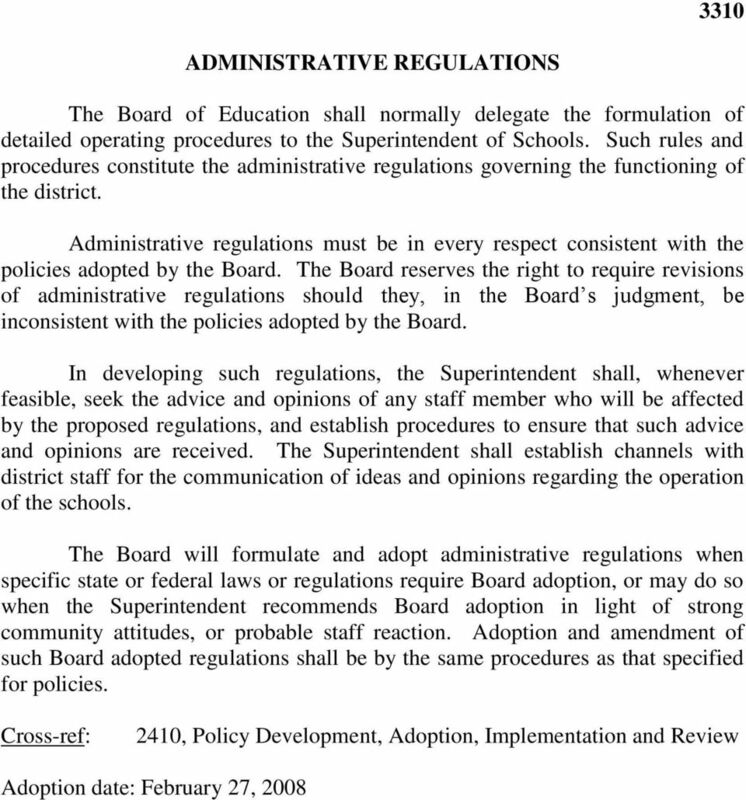 Responsibility shall flow from the Board of Education, to the Superintendent, to Building Principals, to teachers. 3. Each member of the staff shall be informed as to whom he/she is responsible and for what functions. 4. Whenever possible, each member of the staff shall be made responsible to only one immediate supervisor for any one function. 5. Each staff member shall be informed as to whom he/she can appeal in case of disagreement with an immediate superior. 6. Each staff member shall be informed as to whom he/she should report to for help in carrying out his/her functions. 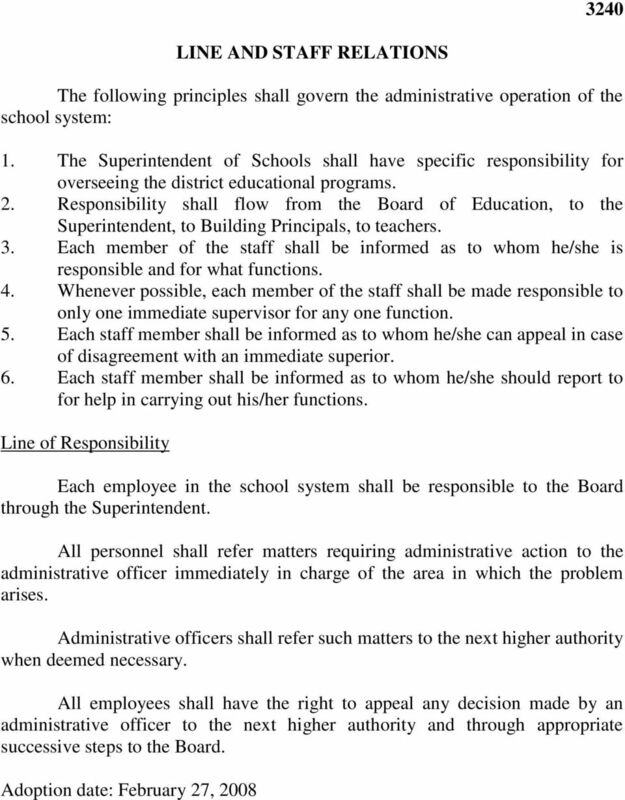 Line of Responsibility Each employee in the school system shall be responsible to the Board through the Superintendent. All personnel shall refer matters requiring administrative action to the administrative officer immediately in charge of the area in which the problem arises. Administrative officers shall refer such matters to the next higher authority when deemed necessary. All employees shall have the right to appeal any decision made by an administrative officer to the next higher authority and through appropriate successive steps to the Board. 11 3250 SCHOOL BUILDING ADMINISTRATION The Superintendent of Schools will delegate administrative authority to the Building Principal of each school and to his/her assistant(s) within the district's system for the internal management of the schools, within established Board of Education policy and administrative regulations. PERFORMANCE EVALUATION FOR POLICE EMPLOYEES FUNCTION CODE: 370 EFFECTIVE DATE: 01-11-99 Contents: I. Policy II. Objectives III. Raters' Responsibilities IV. Review Process V. Probationary Employees VI.